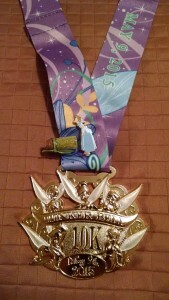 I admit it: I’m a sucker for bling, and running this race would help me earn another inaugural medal: the Pixie Dust Challenge medal. Since we missed out on doing the 10K at the runDisney Star Wars Weekend, this would be my first 10K at Disneyland. And all the rumors said that the Disneyland 10Ks are great because they stay mostly within the parks for the majority of the course. I had to see this for myself. In what seems to be a growing trend with runDisney, the Tinkerbell weekend in Disneyland immediately followed the Expedition Everest Challenge weekend in Walt Disney World. I have to admit these back-to-back trips are starting to wear on me (we did the same thing with the WDW Half Marathon and Star Wars weekend in January, and even sandwiched the Parks to Paradise Challenge in between), and I’ll be pleased if runDisney decides to stop scheduling back-to-back race weekends across the country. 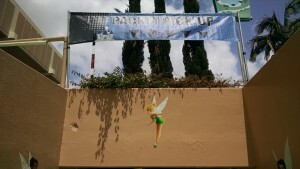 Tinkerbell herself welcomed Casual Runners to the event. 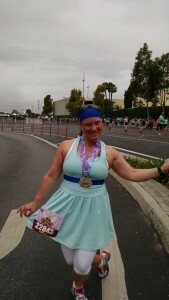 Tinkerbell’s Pixie Dust Challenge was not my first 10K/half challenge since my husband and I did the Glass Slipper Challenge at Disney World’s Princess weekend just 2 months earlier. So training-wise all I had to do was to keep some back-to-back long runs in my training schedule to maintain my endurance. My husband and I arrived at Disneyland a few days before the Tinkerbell weekend kicked off, so we decided to attend the expo the first day it opened to get it out of the way and then enjoy time in the parks. We did not, however, go first thing on the first morning because we did not want to deal with the crowds who wanted to be first in line for the official race merchandise. (Not that there’s anything wrong with it, but I just cannot bring myself to stand in line to buy stuff. Then again, I never could get into shopping on Black Friday either…). The Tinkerbell Expo was pretty similar to the Star Wars Expo: Packet pick-up was downstairs in one building where we got our bibs and wristbands for the pink Coast-to-Coast medal, and took our pictures for the Pixie Dust Challenge. This was also the place where you would pick up any pre-ordered commemorative items. Then we moved to a second building for our race shirts, the vendors, and the speakers. Although we have seen these same vendors at several races we still did an obligatory walk-through just in case there was something new to catch our eye. We did stop to purchase a few items in the official merchandise section, specifically a couple of race pins for our medal ribbons and a magnet for a friend who would be running her first half marathon with us on Sunday. Like the Expedition Everest shirts, the race shirts at Tinkerbell seemed to be made of a lighter fabric than the heavier polyester we got for the first several Disney race weekends this year. 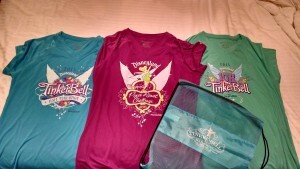 The shirts for the 2 races plus the Pixie Dust Challenge and the bonus swag bag. Since we were doing the Pixie Dust Challenge we got three shirts: a teal one for the 10K, a light blue one for the half marathon, and a magenta one for the challenge. We also got a light blue mesh drawstring bag and a small Luna bar. Basically, we got the typical runDisney swag. Since my husband and I planned to run this race together we themed our costumes together. He was Peter’s Shadow (which, while a pretty simple costume, got an incredible response from the other runners) and I was Wendy (which got a response more like: oh…yeah…huh, that’s cute…could you take a picture of me and Peter’s Shadow?). 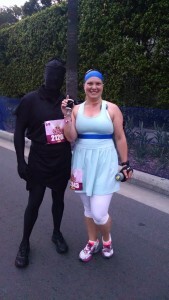 Wendy is already to take on the 10k, but shhhh, don’t tell Tink, she may be jealous. This was actually a pretty comfortable costume and even if it was not super popular it is definitely one I’d consider running in again: light blue tennis dress, white leggings, blue ribbon to tie around my waist and ponytail, and a large spool of thread to sew Peter’s Shadow back onto Peter’s feet if he ever found it. As for everything else: white Adidas sports bra, blue Bondi Band headband, Injinji socks, Brooks Adrenaline GTS 14 shoes, Garmin Forerunner 620 and Gymboss interval timer, and Nathan handheld hydration bottle. The best thing about races at Disneyland is that, unlike Disney World, you don’t have to catch a bus 3 hours before the race even starts and then stand around in cold corrals for hours and hours. Our hotel was about 2 blocks away from the intersection of Disneyland Drive and Katella Avenue, where the corrals lined up. The race officially started at 5:30 AM, and we didn’t even walk out of our hotel until 5:35. We missed all the pre-show and the National Anthem, and we walked straight into our corral (D) as it was starting to move up to the starting line. We chatted with the ladies around us as we slowly walked forward, stopping to take some pictures with fellow runners. It seemed like just a few minutes after we arrived we crossed the start line and began our race. This was a great 10K course! We spent the first 1.5 miles circling the streets outside of Disneyland, getting the inclines out of the way and thinning the crowd. We spent a little more than a mile inside Disneyland, crossed into the backstage area to cross into California Adventure, spent another 1.5 miles in that park, and then ran along the edge of California Adventure for the last half mile to the finish line. Peter’s Shadow and Wendy conquering the 10k course. With so much time in the parks, the miles just flew by as we passed lots of character picture stops (mostly Tink’s fairy friends) and backstage props. The only slight disappointment in the entertainment was that they didn’t have any of the other main characters from Peter Pan out—no Hook, Pan, Wendy, Lost Boys, or Smee. Unexpected Magic: Early in the race my husband lost his hat since the body suit covering his head was really slick and he hadn’t fastened it down. But about a mile later a woman dressed as Tink caught up with us and had it in her hand! She fell in pace with us and we ran with her for most of the race, though we unfortunately lost her near the end. If you’re reading this, June, it was great meeting you and thanks for returning the hat! I thought the medal for this race was particularly lovely, surrounded by the iridescent wings of five fairies. In fact, I think it was my favorite of the four SMOs I ended up bringing home from this trip. The FAIRY nice race medal (sorry, couldn’t resist the pun!). My husband and I grabbed our waters and bananas, and headed back to our hotel to shower and change. We were surprised to not get the standard snack box runDisney usually gives out, but apparently after the 5K they realized the applesauce in the boxes was expired and they did not have time to completely repack the boxes before the 10K. I personally did not need more than what they provided, but I did hear a good amount of grumbling about the lack of snack boxes. Still, I understand why runDisney did it: if anyone had gotten sick from expired food they would have had a bigger liability on their hands than they created by not giving out the expected snack boxes. You know the drill—I ran with my husband so I did not carry my iPod. I really enjoyed this race. The course was mostly in the parks, which is the whole reason you do runDisney races (otherwise, why pay that kind of money?). I like the 10K length as it is long enough for my muscles for fully warm up and I can get into a running grove, but not so long that I start to mentally lose interest in running. I also like that my husband and I can mostly match paces for a 10K, which is something we cannot do for a half marathon, so 10k is the longest distance we can do together. Of the two races, I probably preferred the 10K over the half course, and it’s the one I would probably most look forward to doing if I were to do the Tinkerbell weekend again. Jennifer will be back with her review of the Tinkerbell Half Marathon, and you can check out the full gallery of pictures from the Tinkerbell race weekend at the Disneyland Resort on our Facebook page. Also, if you are curious about what it is like to run races at the Disneyland Resort, check out our YouTube videos from the Disneyland 10k and Disneyland Half Marathon events. Sorry my last comment got cut off. I did not realize the reason for not getting the snack box was due to the expired applesauce till I got home. Better to be safe then sorry! 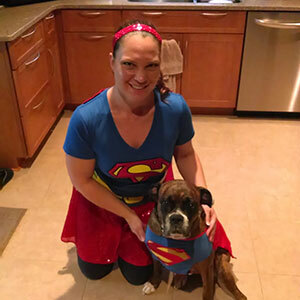 Cute costumes too! Thanks, Meranda! My husband does most of the work on our costumes (bless his heart). I think he does a great job. I hope you had a good race and maybe I’ll see you at a future Disney event!